This Valentine’s Day, Tesco is launching a bundle deal, a great gift for customers who are looking for a quick and effortless way to say ‘I love you’ that won’t cost the earth. 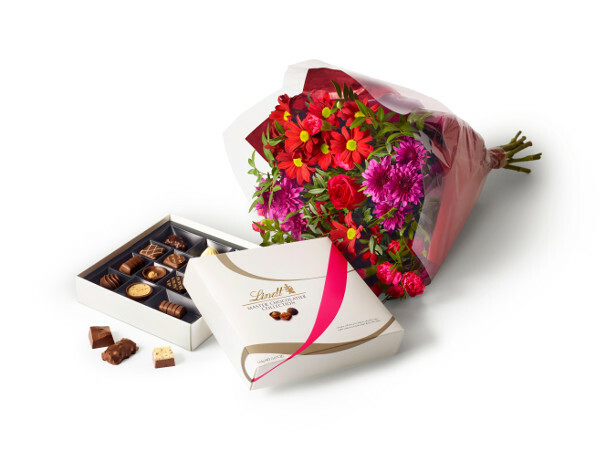 Lovebirds can pop into store and pick up a bouquet of vibrant flowers and box of smooth, rich Lindt chocolates for just £10 – saving all those romantic lovers £7 off the normal retail price of £17 if purchased individually. With chocolates and flowers going hand in hand as a traditional way to mark the special occasion, the Tesco bundle deal allows customers to pick up two of the most wanted Valentine’s Day gifts without breaking the bank. The value for money bundle deal is a sure-fire winner, as customers will be able to spend less time hunting for the perfect gift and more time cosying up to their sweetheart. This expertly crafted vibrant colour combination fits in with the Valentine’s trends, with romantic hues of red, cerise and purple. This colourful bunch contains eight stems of chrysanthemums as well as the spray carnations. To get the best from the flowers and prolong their life, trim all stems approximately 1.5cm, and display in a clean vase filled with fresh water and the flower food provided. Keep them away from draughts, out of direct sunlight and away from direct heat, to help prolong their life. 14 assorted fine milk, dark and white chocolates are created using deliciously crafted chocolate recipes by the Lindt Master Chocolatier. With an array of textures and flavours to please every palate, this is the ultimate chocolate indulgence. There are also a selection of hand tied Valentine’s bouquets are available in store at different price points, including; The ‘Dozen Roses’ bouquet which is made up of 12 single stem red roses and costs only £5. This simple bouquet is all that’s needed to say, ‘be mine’. For those looking for an alternative to roses, the £10 ‘Loving You’ bouquet has been lovingly created with an array of chrysanthemums, cerise carnations, white antirrhinums and a glittered red rose, ideal to present to a loved one’s this Valentine’s Day. Head into store to find the complete Tesco Valentine’s Day range, including additional flower bouquets and plants, fizz, chocolates and cards to spoil that special someone.